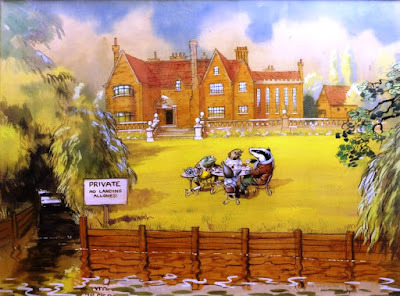 Last week, I changed the cover photograph on my Facebook page from a photograph of the Moat House in Tamworth to a colourful illustration of Toad, Mole, Rat and Badger enjoying a summer picnic by the willows and the river on the lawn of Toad Hall. 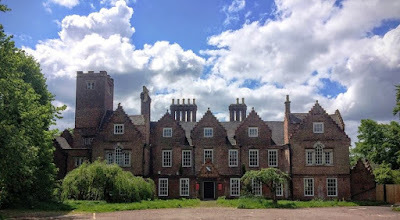 The exchange was interesting, for I have wondered sometimes whether the Moat House, with its setting among the willows by the banks of the River Tame, might have been an ideal location for Toad Hall until the surrounding Staffordshire countryside gave way to the expanding urban needs of Tamworth. But the exchange of responses on Facebook to that image of Toad Hall was interesting too. On an evening that was marked by heavy August rains, I had asked whether this is what summer should be like, drinking Pimms on the lawn of Toad Hall with Toad, Rat, Badger and Toad, by the willows and the river. One two-word reply called out Semper Buffo! I was impressed that someone in middle age could still remember Toad’s motto, although I descended to pedantry with classical pretensions when I pointed out that the spelling is Semper Bufo. Someone else thought ‘No,’ this was not what summer was about, for Toad is ‘completely unreliable and has probably drunk all the Pimms before he goes off to crash his car!’ Another friend posted a warning to watch out for the stoats and weasels. It all goes to show that The Wind in the Willows, known to many readers through theatrical adaptations such as AA Milne’s Toad of Toad Hall, is one of those classics of modern English literature that remains a firm favourite across the generations. One of those children, one of my nieces, thought these were four nicknames I had conjured for her and her two brothers and sister. It was a joy to introduce yet another generation to The Wind in the Willows. It is a children’s book that appeals to endless and successive generations of children and adults alike, and that is recycled time and again, over and over, in print, cartoon and cinema, even in the most unlikely places: Chapter 7, ‘The Piper at the Gates of Dawn,’ provided Pink Floyd with the name for their first album half a century ago in 1967. Perched on cushions in the school library, he read from The Wind in the Willows, by Kenneth Grahame, which he said is one of his favourite childhood books. ‘It’s about a rat and mole,’ he began. ‘My particular hero is a guy called Mr Toad. His family motto is Semper Bufo, which means ‘Always a Toad.’ Mr Toad was a very keen motorist you see and also a Latinist,’ he explained. The Wind in the Willows, first published in 1908, is a hymn to a long-lost England that may have never existed. It was an England that Edwardian society wistfully hoped could be conjured up but that could never be returned to. I cannot imagine that Kenneth Grahame ever knew of the Moat House, the Comberford family’s former Jacobean townhouse in Lichfield Street, Tamworth, by the willows and the waters of the River Tame. But there was a Comerford family connection, for his first cousin was Sir Anthony Hope Hawkins (1863-1933), a son of the Revd Edwards Comerford Hawkins (1827-1906), Vicar of Saint Bride’s in Fleet Street, London. As Anthony Hope, he was the author of another early 20th century Edwardian fantasy, The Prisoner of Zenda, and they were cousins too of the Irish rugby superstar and war hero Basil Maclear (1881-1915). Kenneth Grahame (1859-1932) was introduced to the riverside and boating by his uncle, the Revd David Ingles, the curate at Cookham Dean in Berkshire. Cookham was also the home of the artist Stanley Spencer (1891-1959), who often used Cookham and the river as the backdrop to his religious paintings.